BM Equine Services Limited is based in West Sussex in the UK and has over 20 years experience in producing young horses to Olympic level. We specialise in hand picked competition youngstock and are involved in breeding sports horses for both showjumping and eventing. 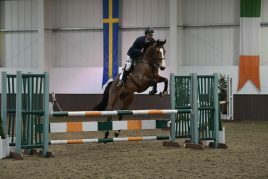 We are experts in maximising the horses’ potential. We are always interested in meeting new clients, so please don’t hesitate to contact us. Videos showing us jumping at our facilities and in competition (click on video to play).